Any surfer who has leaned over to pick something up a few hours after surfing, only to suffer the embarrassment of having their nose drain all over the place, is a walking illustration of just how much ocean water surfers are exposed to when practicing their sport. According to the 2001 Current Participation Patterns in Marine Recreation study, beach goers average 14 visits per year; in the same study surfers averaged 23 visits per year (Leeworthy and Wiley 2001). Other studies in Oregon, California, and a national survey suggest surfer avidity is much higher. In Oregon, the average avidity was 77 visits/year (Stone et al. 2008). At Trestles, we found an average avidity of 109 visits/year (Nelsen et al. 2007). A pending Surf-First study found a average national avidity of 108 visits (unpublished). Studies and common knowledge show that beach going is highly seasonal. Most visit occur during the summer months. Often more than half of the total visits occur during the 3 months of summer. In contrast, surfers tend to visit beaches and enter the water year round. In some places, surfers are the predominant beach visitor during winter months. This is significant because in the northern latitudes, winters tend to be more rainy than summer months, which increases the exposure to storm water runoff. According to Dwight et al. (2007) less than half of Southern California beach goers are exposed to ocean waters. And of those that are, many are not fully immersed in the water. Surfers, on the other hand, are fully immersed while surfing (see photo). This increases their exposure to pathogens if the water is polluted. Surfers tend to surf between 1.5 and 2 hours surfing during each visit. Although I am not aware of any data, my guess is that this is longer than most beach goers spend in the water, with the exception of some kids who seem to spend the whole day in the water (especially in places where the water is warm). 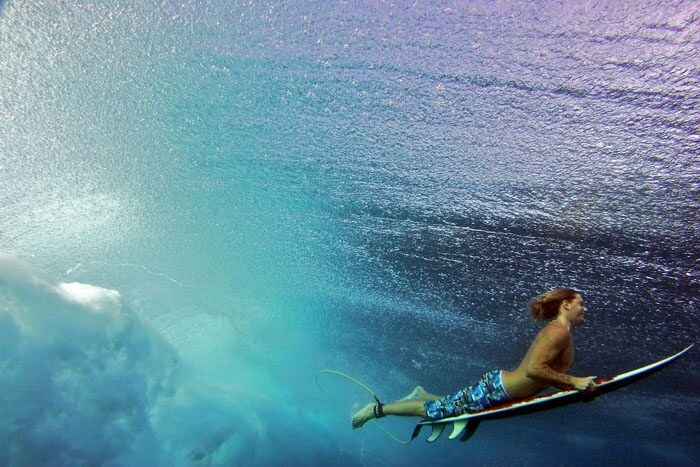 As summarized here, surfers tend to ingest 10 times more water than swimmers or divers. To their exposure to pathogens in the water is much higher than other groups. The repeated, full and sometimes violent immersion in the ocean that surfer experience increases ingestion and water getting forced into the sinuses (thus the delayed nose drip). The combination of more days of exposure, during some of the most polluted times, and more complete immersion and ingestion increases the total exposure of surfers to pathogens and therefore the odds of getting sick. So the next time your nose starts to drip, think about the quality of the ocean water that just sat in your head for the last several hours - hopefully it was clean! The papers referenced below provide a more in-depth look at these issues. Dwight, R. H., D. B. Backer, et al. (2004). "Health Effects Associated With Recreational Coastal Water Use: Urban Versus Rural California." American Journal of Public Health 94(4): 565-567. Dwight, R. H., M. V. Brinks, et al. (2007). "Beach attendance and bathing rates for Southern California beaches." Ocean & Coastal Management 50: 847-858. Leeworthy, V. R. and P. C. Wiley (2001). Current Participation Patterns in Marine Recreation, U.S. Department of Commerce, National Oceanic and Atmospheric Administration, National Ocean Service, Special Projects. National Survey on Recreation and the Environment 2000: 53. Nelsen, C., L. Pendleton, et al. (2007). "A Socioeconomic Study of Surfers at Trestles Beach." Shore & Beach 75(4): 32-37. Stone, D. L., A. K. Harding, et al. (2008). "Exposure Assessment and Risk of Gastrointestinal Illness Among Surfers." Journal of Toxicology and Environmental Health, Part A 17(24): 1603-1615.